A review of Seattle Opera’s presentation of the 2014 chamber opera “As One,” at Washington Hall. It’s not your usual Seattle Opera production: no spectacular sets, big orchestra, or large hall. But Seattle Opera’s presentation of the 2014 chamber opera “As One” has a power all its own. It is the power of intimate revelation, a close encounter in a small gem of a hall where the two singing actors are so near that they can almost touch the audience. And they do touch the audience — with the emotional impact of an affecting story about a child born into the wrong body. The transgender protagonist, sung by two performers (the male “Hannah before” and female “Hannah after”), undergoes a journey from the first misgivings about male gender identity through a challenging transformation into a woman trying to find her way forward in a sometimes unfriendly world. 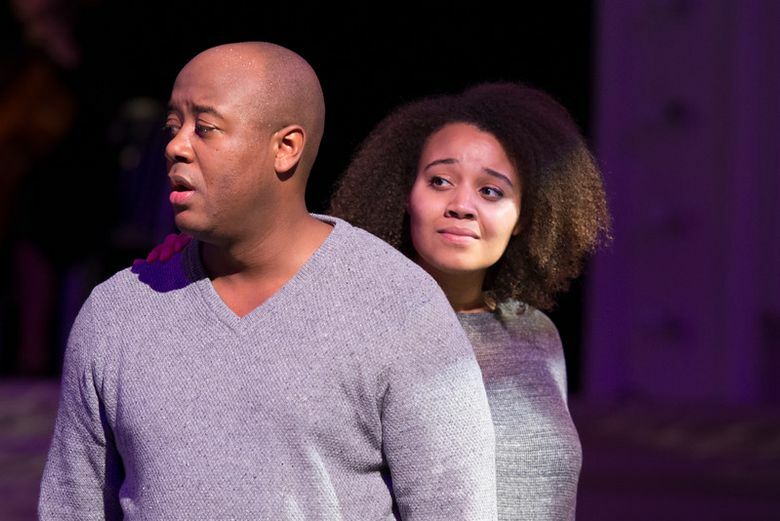 The two singing actors — baritone Jorell Williams and mezzo-soprano Taylor Raven — are passionate, powerful performers who draw the audience into this difficult process, with its joys and its crushing setbacks. by Laura Kaminsky, with libretto by Mark Campbell and Kimberly Reed; presented by Seattle Opera. Repeats Nov. 13, 17, 18 and 19, Washington Hall, 153 14th Ave., Seattle; $25-$40 (seattleopera.org). Over the course of 15 songs, we see baritone Williams initially following boyish pursuits (a paper route and sports), gradually joined onstage by Raven, who represents the girl he’d rather be. That wish is solidified when “Hannah before” discovers facts about sexual identity in the library, begins dressing like a woman and takes “yellow pills” (hormones). Laura Kaminsky’s mainly minimalist score, performed brilliantly by the Saint Helens String Quartet, chugs busily along, with some beautiful lyrical moments — and some cleverly surreal swooping and drooping during Hannah’s disorienting hormonal transformative period. To accompany incidents in the libretto, there are snippets of Christmas carols (“O Come, O Come, Emmanuel”) and Norwegian music (a wisp of Grieg’s “Solveig’s Song”). Seattle Opera’s John Keene deftly conducts the four instrumentalists (Liza Zurlinden, Sol Im, Annie Chang-Center and Paige Stockley) with precision and impact. Stage director L. Zane Jones moves the singers expertly about G.W. Mercier’s minimalist set, as they push chairs and doorways about the stage to “frame” each new scene. Connie Yun’s lighting underscores every vignette, and gives us some inspiring Northern Lights. In the opera’s climactic scene, Hannah’s “after” transformation finally leads to joy, when she tenderly flirts for the first time with a man in a coffee shop — and then to terror, when she is assaulted in a parking lot (while “Hannah before” recites the names of those who have been killed in similar attacks around the world). Terrified, she moves to Norway, staying for a period in a remote waterside cabin with a leaky boat; here the opera loses a little energy by the time we hear about the second episode of berry jam-making. But the finale, where Williams and Raven sing together truly “as one,” is as uplifting as any operatic ending could be. The performance was preceded by two firsthand accounts of their personal transgender journey by community participants Mitchell C. Hunter and Breanna Anderson — both powerfully affecting, and setting the mood for the story told in the production. Melinda Bargreen, who has reviewed music for The Seattle Times since 1977, is the author of two books, “Classical Seattle” and “50 Years of Seattle Opera”; she also writes for 98.1 Classical KING FM, Symphony Magazine and The American Record Guide. She can be reached at mbargreen@gmail.com.